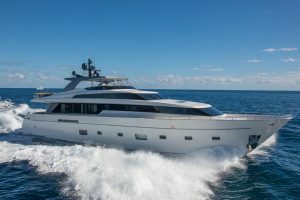 The 104' Sanlorenzo 2011 has a coveted on deck master! : Atlantic Yacht & Ship, Inc. The 104′ Sanlorenzo 2011 has a coveted on deck master! The 104′ Sanlorenzo 2011, “Rare Diamond,” will be displayed at the Miami Yacht Show February 15-19, 2018. For more show information and where she will be located, click our Event Calendar. The name “Rare Diamond,” truly suits this 104′ Sanlorenzo 2011. She shines bright like a diamond with her stylish lines and glistening gel coat . Upon closer inspection, she appears flawless with her newly refinished teak decks and shiny chrome accents. Enter the vessel via sliding doors to a fabulous Salon impeccably furnished with earthy toned fabrics and natural woods. Custom bronze stainless overhead liners are utilized in the salon, corridors, on deck master stateroom, and heads along with LED lighting throughout. The 104′ Sanlorenzo has a coveted on deck master suite with a concealed TV inside the mirror in order to vanish from sight. Large windows forward, port, and starboard as well as, a retractable sunroof allow for a gorgeous view and natural lighting. Furthermore, the owner of this Sanlorenzo ensured that this vessel was built to RINA classification. Given these points, check out this Rare Diamond on our YouTube channel. Contact Joe Marino at Atlantic Yacht & Ship, Inc. for more information.